I don’t know about you, but sometimes I get all excited about a book, and then it arrives and I won’t touch it. Am I intimidated? Procrastinating? Saving it for the perfect day and mood? I haven’t figured out that part of my psyche yet. The latest victim of this “waiting game” was David Lebovitz’s cookbook My Paris Kitchen: Recipes and Stories. Visually, it’s a gorgeous volume, and Lebovitz has a way with words. So why did it sit on the side table untouched for almost 5 months? That’s a mystery for another day. I’d better get back to telling you how great it is! It’s been ten years since David Lebovitz packed up his most treasured cookbooks, a well-worn cast-iron skillet, and his laptop and moved to Paris. In that time, the culinary culture of France has shifted as a new generation of chefs and home cooks—most notably in Paris—incorporates ingredients and techniques from around the world into traditional French dishes. In My Paris Kitchen, David remasters the classics, introduces lesser-known fare, and presents 100 sweet and savory recipes that reflect the way modern Parisians eat today. You’ll find Soupe à l’oignon, Cassoulet, Coq au vin, and Croque-monsieur, as well as Smoky barbecue-style pork, Lamb shank tagine, Dukkah-roasted cauliflower, Salt cod fritters with tartar sauce, and Wheat berry salad with radicchio, root vegetables, and pomegranate. And of course, there’s dessert: Warm chocolate cake with salted butter caramel sauce, Duck fat cookies, Bay leaf poundcake with orange glaze, French cheesecake...and the list goes on. David also shares stories told with his trademark wit and humor, and lush photography taken on location around Paris and in David’s kitchen reveals the quirks, trials, beauty, and joys of life in the culinary capital of the world. In My Paris Kitchen, blogger/chef/celebrated food writer David Lebovitz invites the reader into his own kitchen. As is evident from the cookbook’s title, Lebovitz makes his home in Paris, France, and has adapted his cooking (and baking!) to his surroundings. He visits local markets and shops and is dedicated to making regional dishes with the best ingredients, and then to telling the world about it. His particular fusion of American and French food sensibility (and the stories that go with them) is fascinating, mouth-watering, and inspiring by turns. This book may well spark a desire within the reader to pack up and make an Atlantic crossing. That French market rotisserie chicken sounds divine. With most cookbooks I can tell pretty quickly that either the food or the writing is the chef’s sweet spot. I mean, if they’ve gotten to the point of writing a cookbook, I assume that they’re freakishly talented in both areas, but usually I can tell if they’re a writer who happens to be a great cook/photographer, or a professional cook with a good story or restaurant to rep. David Lebovitz is an equally brilliant writer and chef. His writing put me right in the midst of the modern Paris cooking scene, and his recipes sent me to foodie heaven. Color me impressed! I firmly believe that no cookbook review is complete without a recipe test. I had the ingredients on hand to make the individual chocolate cakes with salted dulce de leche, so I made those first. Verdict? Very rich, and a tad too salty. The salt was toned down when they were served with vanilla ice cream, as the recipe suggested. But I had 6 little pots of extremely rich chocolate dessert, and I was NOT going to go into a sugar coma for a cookbook review, so I pawned them off on the roommates and scrapped the rest. I decided to host a dinner party for my next taste test, and prepared chicken with mustard (the photo on the cookbook cover! ), celery root puree, and winter salad. HOLY GOODNESS, Batman! Like, 5 stars across the board. All of it was amazing, and I impressed both my guests and myself. Just… so good. I’m going all gooey and happy just remembering it. 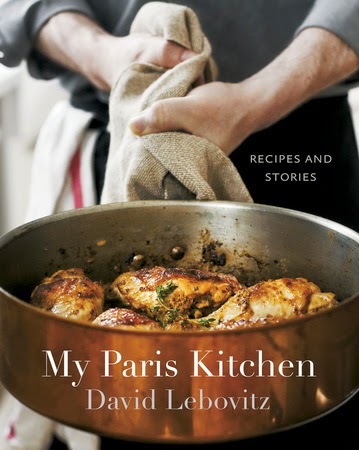 David Lebovitz, you and your Paris kitchen win all the things. So, I hosted a successful dinner party, loved the food, and was all-around awed by the writing. BUT… (+10 points if you knew there was a qualifier coming) I am not a fussy cook. Baking is more my thing, and while I’m happy to follow arcane instructions for a pastry payoff, I’m less likely to put in hours of prep work (and $$) while cooking. It comes down to the fact that I can’t see myself pulling this book down off the shelf more than once a year. And a cookbook should be loved and used more often than that. What does that mean in real terms? I can recommend it whole-heartedly to intermediate cooks, especially those with a yen for international cuisine. And I can appreciate its brilliance. That said, My Paris Kitchen won’t live on my shelf. I’m not ready for it yet. Maybe in 10 more years. In the meantime, I can honestly recommend it for really marvelous food, great writing, and an authentic French experience. I can see why it was on so many best cookbook of the year lists. It’s excellent. Recommended for: intermediate-level cooks (and above), anyone interested in the modern Parisian food scene, and those who appreciate superb writing. Fine print: I received a copy of this book from Blogging for Books for review consideration. I've heard many good things about this cookbook. And that chicken with mustard does sound good. I'm with you on not minding spending hours to bake something but balking at spending hours to cook a meal! The cookbook sounds great but is probably beyond my skill level, too. I bet I'd love this book (actually, I've been craving it, but have so far resisted buying). Even if a cookbook is too fussy for everyday life, I like having one that will help me pull off the occasional dinner party. I want to make that chicken! I am more in love with the idea of cooking than I am actually good at cooking. I am not a fussy cook because, frankly, I can barely pull off baking biscuits from a can. lol BUT I am trying hard to learn to cook more dishes this year. Sounds good! I must admit that on salted caramel/dulce de leche recipes I always half the salt. I'm just not into that salty taste. I had this sitting by my bed for months before I cracked it open and then could not get enough of it. Wow, your dinner party sounds fabulous. Unfortunately, I'm not at an intermediate cooking level yet (I'm still semi-regularly burning things), but I hope to be one day! I love that you said intermediate cooks, I love to cook, but I'll be the first to admit, I'm not the best at it. I may have to get a hold of this one to give it a try.